Look what I found!! I tell you folks, these babies from Haiti were monstrous! And not only that, the whole lot of them were beautiful, clean and undamaged. What a TREAT! 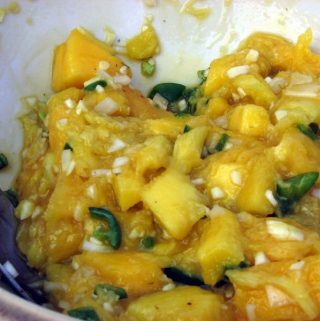 In an earlier post, I covered the Ataulfo mango, and I’ll give it to you – the Haitian mango looks an awful lot like an Ataulfo. But it isn’t. The Haitian mango (also known as the Francine mango or the Madame Francis mango) is – as you can see- a fair degree heftier than its friend, the Ataulfo mango. They do share that wonderful, buttery smooth flesh with the Ataulfos, though, and that is why I’m a huge fan!!!! 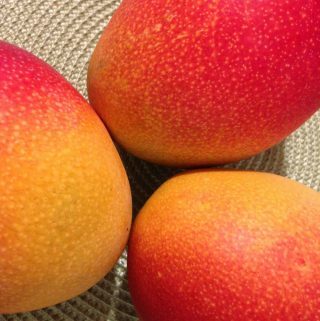 The Haitian mangoes have just a six-to-eight week season, so you have to watch carefully for them in late spring. The mangoes I purchased were part of Whole Foods’ Fair Trade program. In the case of Haiti, Whole Foods is the sole buyer of Certified Organic mangoes from small Haitian growers – sometimes buying from individuals or families with just a single tree! I’m guessing the Haitians were really thrilled to get some solid export dollars for their mangoes – and I for one was happy to do my part as a consumer. Oh, and one more thing – when I brought my Haitian mangoes home, they were still greenish – yellow. I let them ripen in my pantry until they were bright yellow with little wrinkles. Bottom line, never be afraid to bring home a green mango!